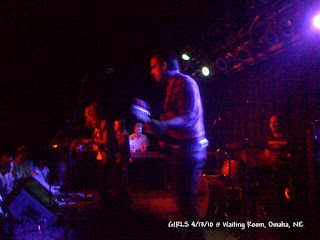 This will be a very brief review of last night's Girls/Dum Dum Girls show at The Waiting Room. I got to the club just a few minutes before Dum Dum Girls began. Their set was enjoyable enough. I like the vintage girl group vibe that DDG provides, even though I liked their record more than I did their live performance. Next up was the headliner, Girls. This SF band has generated a ton of buzz with the release of their album, Album, last year. The Omaha hipster contingency was in full force last night. Hell, even Conor Oberst was in the crowd! But all that buzz could not hide the basic fact that Girls was a boring live band. It seemed like every song was ridiculously slow, there was zero banter with the crowd, and they pretty much played in the dark. I left early.